Our first open submission period closes in one week. 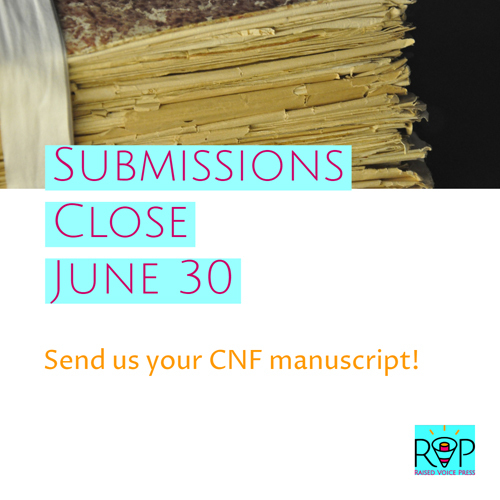 If you’ve been planning to send us your work, please get your manuscript to us by midnight on Saturday, June 30. Full submission guidelines are here. For those who have been waiting to hear from us, we will respond to everyone who has submitted no later than July 31. We’ve been busy working behind the scenes to get Raised Voice Press up and running and expect to publish accepted manuscripts in early 2019. Raised Voice Press is a new independent micro-press publishing creative nonfiction. We aim to encourage conversations by amplifying diverse perspectives. Our first open submission period has been extended until June 30. We are seeking creative nonfiction manuscripts between 100-250 pages that might be described as literary nonfiction, narrative nonfiction, imaginative nonfiction, literary journalism, lyric essay, personal essay, personal narrative, or literary memoir. We appreciate authors who illuminate unconventional and unnoticed aspects of existence. We want the unusual and the overlooked, the complex and the hybrid. We offer a $200 advance plus 10 print copies of your book, as well as royalties. We will partner with you on developing a custom marketing plan and we will enthusiastically support your book’s success. Our mission is to connect innovative nonfiction authors with eager, receptive readers. We want to help you be heard. For details on how to submit, please see our full guidelines here.